The Woodman's Child. 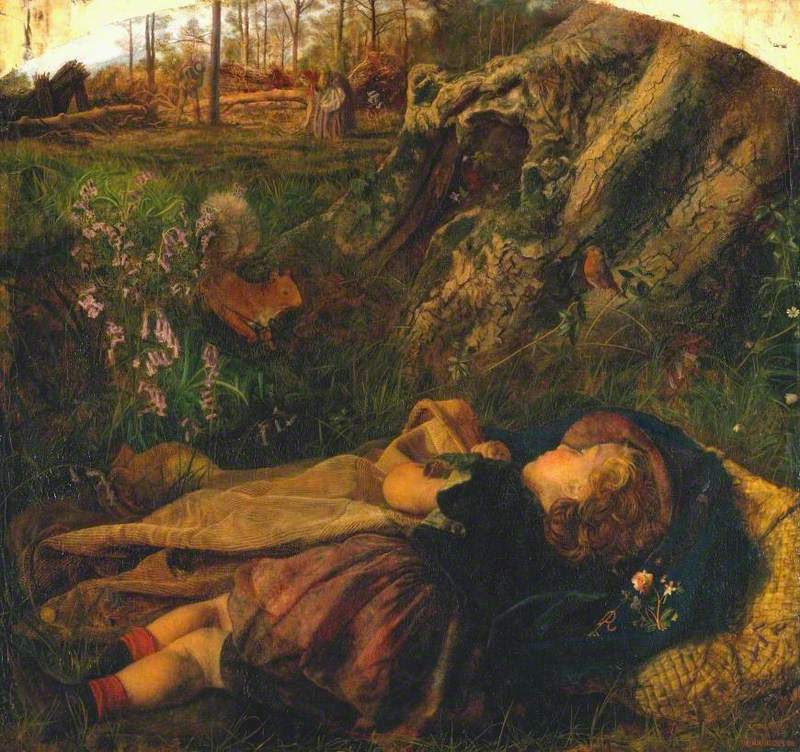 Arthur Hughes (1832-1915). 1860. Oil on canvas. H 61 x W 64.1 cm. Collection: Tate Britain. Accession no. T00176; acquisition method: presented by Mrs Phyllis L. Holland 1958. Kindly made available by the Tate Gallery on the Creative Commons Attribution-NonCommercial-NoDerivatives licence. Image acquisition (via the Art UK website), commentary and formatting by Jacqueline Banerjee. This is a partner to Hughes's much larger Home from Work, which depicts a woodman coming home with his bundle of sticks, and being welcomed with special enthusiasm by his baby daughter. These were both commissioned by the Gateshead art patron, James Leathart. Here, the little girl is sound asleep in a sheltered nook, her head resting on a satchel and shaded by a brimmed hat, with a little blanket or shawl, now untucked, only partially covering her frock. A robin and a squirrel are, it seems, watching over her. In the distance her mother and father can be seen, her mother stooping to forage, her father working just behind the tree-trunk in the centre. Very minute Pre-Raphaelite detail fills the foreground (the child is depicted in such close detail and with such tenderness that it seems likely that the model was one of Hughes's daughters, though Stephen Wildman tells us that Emily, whom both Terry Riggs and Christopher Newall suggest (Newall 33), was born in late August 1861, and the painting was exhibited at the Liverpool Academy in 1860. The child who is wearing shoes and socks here was therefore more likely to have been Amy, born in December 1857.